It has been a fairly happy day. I was featured in The Star Press, we performed Smoke on the Mountain in front of our largest audience to date, and Roger and Rita Wessel bought me my onion rings and cherry milkshake at the Chocolate Moose. I need more days like this! 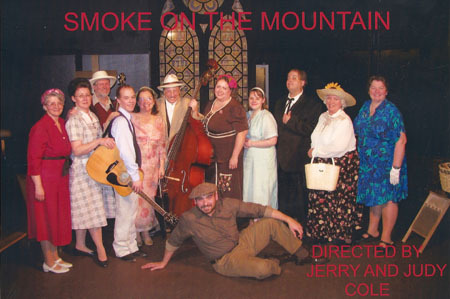 GOOD NEWS: Smoke on the Mountain winds up its run this weekend at the Main Street Studio Theatre and, like the previous two weekends, we’re sold out! Yay! I’m so proud of our little cast and crew! Everybody is doing such a great job with their roles and the music is so rich and energetic. I knew during our first week of rehearsal that we had the potential to create something wonderful on stage and it’s nice to be proven right for a change! BAD NEWS: According to Thursday’s Star Press, Muncie is on the verge of losing its public access channel. Apparently, Comcast eliminated its public access coordinator position due to budgetary reasons and is hoping the City of Muncie will step up to the plate and assume the duties of making the channel run. Of course, depending on the city government for any type of help is laughable and, since Muncie is currently running on fumes, I’m afraid public access is on its way out. It’s a shame to see it happen, but Comcast and Muncie never truly gave the channel the support it needed to survive. As you probably know, Those Funky Idiots started out as a show on public access so I have a certain fondness for the channel. It had so much promise and potential at first. I love the idea of local people making their own programs and I’m still disappointed so few took the opportunity to do so. I know all us Idiots had a blast making our humble garage sitcom. Making those episodes all those years ago were some of the best times of my life and I still miss creating the show to this day so it’s sad to think my old TV “home” is about to become history. GOOD NEWS: I was recently interviewed by John Carlson from The Star Press for an article that will be in next Saturday’s paper (February 28, I do believe). I still find it hard to believe anybody would be interested in reading about this particular fat cartoonist, but I’m sure the piece will look nice in my scrapbook. Of course, expect a link once the big day arrives! We opened Smoke on the Mountain last night and the show was great fun! You couldn’t ask for a better opening night! Everybody sounded great, the harmonizing was pitch perfect, we got plenty of laughs, and the audience really seemed to have a good time. It definitely felt good on stage, too! And I didn’t screw up the lyrics to Jesus is Mine for a change! In other words, top shelf all around! Yay! Well, tomorrow is the night. After weeks of rehearsals, Smoke on the Mountain debuts at Muncie Civic’s Main Street Studio Theatre! Why should you go? Here’s three simple reasons: Great music, a great cast, and I shake a mean tambourine (But, to be honest, my pitch pipe needs work)! Tickets are only 10 bucks (5 for kids/students)! I know I’ll be there. Will you?